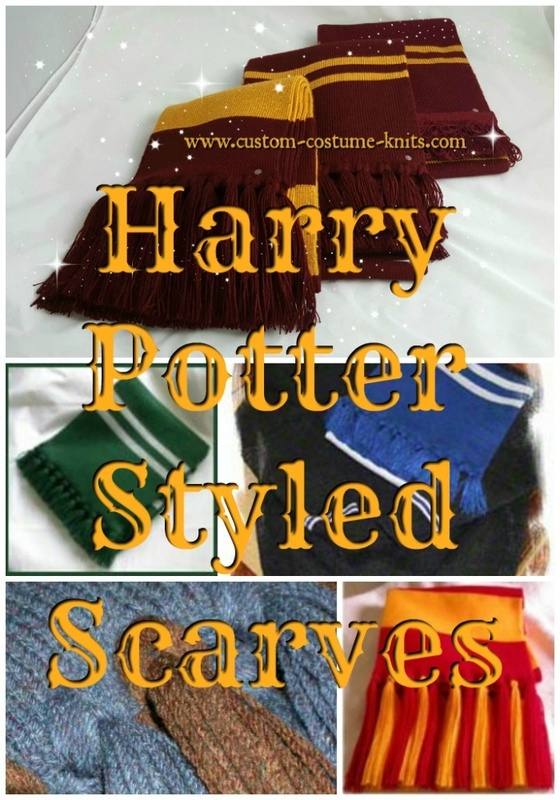 / Buy Harry Potter Scarves: Get Popular Styles! 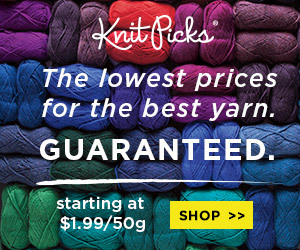 We knit the scarves in several styles! Harry Potter scarves in all styles are still everyone’s favorite – from the Chambers of Secrets© wide stripe version, to the Prisoner of Azkaban trapped-bar style and the Goblet of Fire ribbed scarf! The Beast version looks positively splendid! 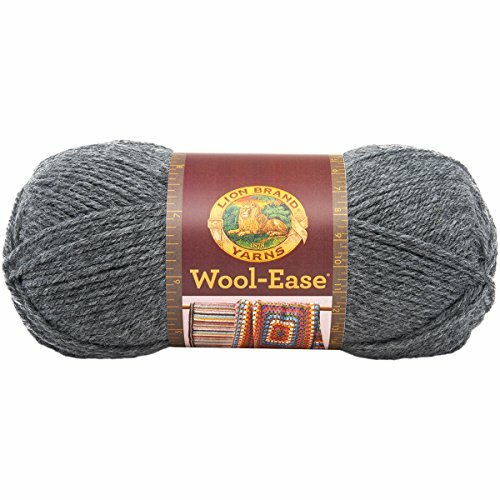 In a hurry for a costume prop? Chose from a wide selection of Hogwarts scarves . Wear a wizard scarf in your distinctive House color and your favorite style. Now you can wear your school colors with pride! Keep wonderfully warm during your everyday adventures wearing a Harry Potter® styled scarf from Hobbie’s House and Custom Costume Knits. 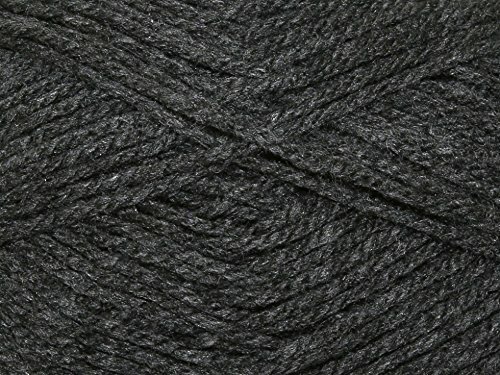 Popular with wizards of all ages from coast to coast, and beyond, Hobbie’s wizard scarves are knit in high quality, imported 100% acrylic yarns . 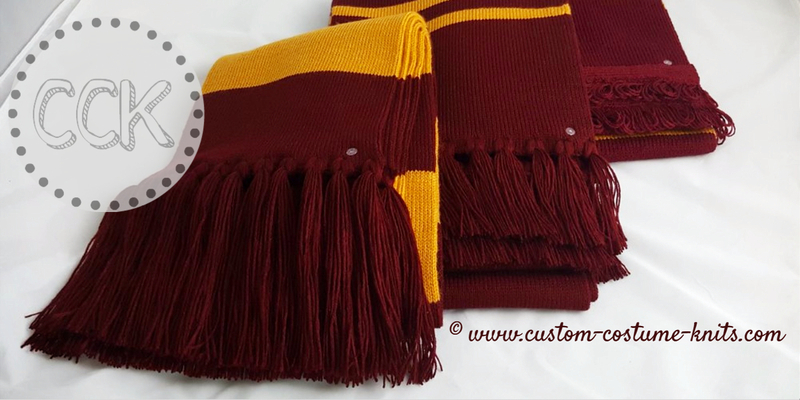 Buy Harry Potter Scarves – Custom Made In Several Sizes & Eight Colors! 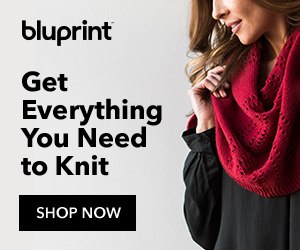 The double layer of knit fabric adds warmth and body to any version of this long, boldly striped scarf. 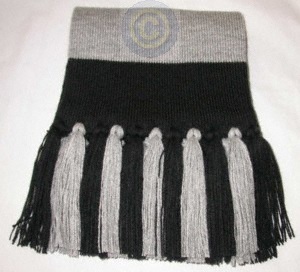 The ribbed scarf is wonderfully heavy and drapes softly. We made sure that the colors match with trapped bar silk ties. 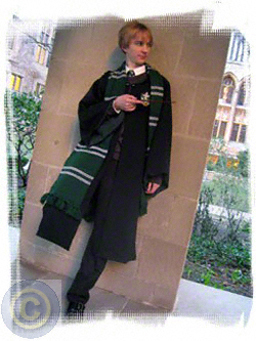 Traditionally, the school scarf [be it for Wizard School or public school] is an optional accessory. Dark grey trousers, knife-pleated skirts, v-neck pullover sweaters, striped tie, white shirts and collars, grey socks and black shoes belong on the list of regulation school uniform items. 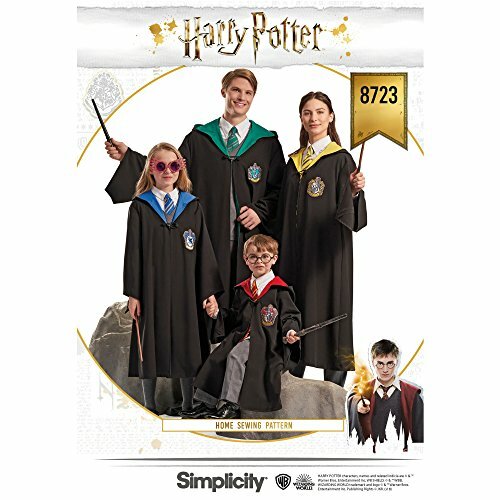 These costume scarves are authentic looking reproductions of the scarves worn by your favorite Hogwarts wizard students. All three styles! COS Style In Scarlet/Gold, Book colors of blue & bronze, POA trapped bar in blue & silver, and GOF in maroon and old gold. 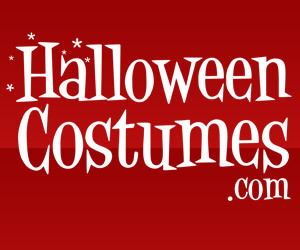 Custom Costume Knits offers scarves in various lengths. They are proportionate in size to fit everyone from children to adults. Looking for a custom color? We’ve knit the Wizard Scarf in High School, University and sports team colors. We do not copy any registered trademark logos or copyrighted names, words and lettering. 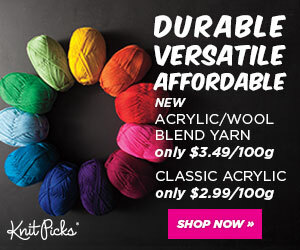 Have it knit in your school or sports team colors or maybe to match a favorite coat. Imagine the possibilities! Do you already know which version of the Wizard Scarf is missing from your school uniform wardrobe? Turn around time is determined by the volume of orders already in the production queue. However, when possible, we work with all our customers to accommodate special delivery dates for events such as birthdays and other special events. The possibilities are endless…the wizard scarf is not only the perfect winter fashion accessory but also a great costume prop. The boldly colored original scarf is seamless and tubular with House color stripes in three distinctive styles. POA colors are seen in later movies . I simply could not be more impressed with the exceptional quality of my maroon and old gold wizard scarf! 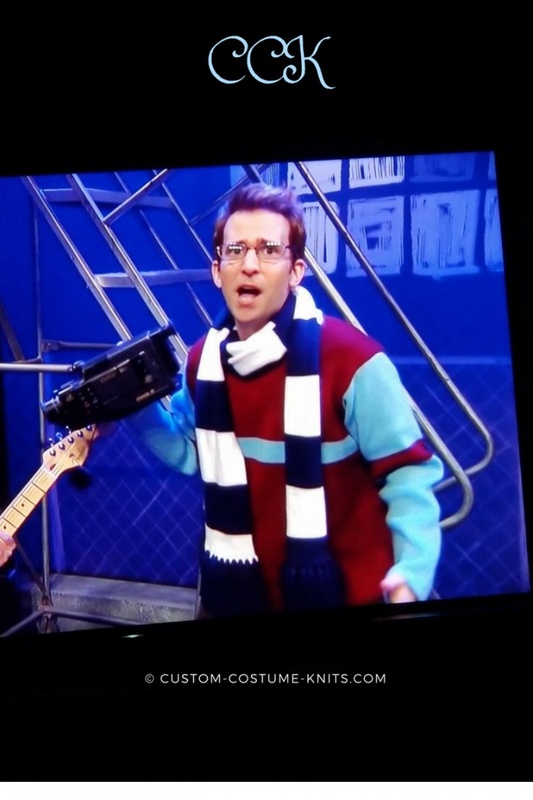 These are the university colors where I’m a graduate student so I was really just looking for a ‘prop’ as part of a costume, but…WOW!…this a serious scarf! Although my scarf wasn’t supposed to arrive for another few weeks, the folks at Hobbie’s contacted me to offer a larger size scarf accessory than the one I had actually ordered (which is an awesome score because I’m tall) and I got my scarf immediately. Again, I’m amazed at how well the scarf is made and will definitely spread the word! Thanks!! !